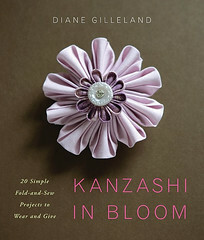 I’ve had Diane Gilleland’s beautiful craft book Kanzashi in Bloom on my table for ever, and the task write a review on my to-do-list since it was published this summer but so far not had the time to write it. The Procrastinator in me has yet again taken over when it comes to writing. Most of the self-assigned writing tasks move from one week to the next on my GDT Next Action List without being crossed of! I don’t know why I do this because I have plenty to say and I know I like to write, but still day after day pass and the headlines on my to-do-list remains unwritten texts. I think I will address the procrastination of writers (aka. me) in another post not to clog this review post up too much. Back to Diane’s book now, okay? The book is about a special Japanese craft where you fold several squares of fabric and assemble them together into a flower. You stitch the petals together and put the flower to use. The petals look almost like they were molded from clay – but it’s quite easy to make the flowers once you know the tricks. And Diane teaches you all the tricks and then some in her book. This form of flower can be used in lots of different ways, which is this books greatest strength if you ask me. All the diverse projects presented as true craft inspiration! Yes even a recycled necktie is in there, making me think of that bag I have again… Maybe 2010 is the year it will transform into something other than non-loved not-used stripes of shiny fabric? Mom and I started to make flowers the minute we opened the book – I run to fetch some rotary-cut quilt squares in cotton for us to practice with. The first flower I made turned in to an adorable pink flower, then used in a project I will show you in my next post! Stay tuned. In this post all photos by me are the images of my mom’s blue and white flowers – she did several in one sitting. All of them ended up as decorations on summer gifts. I also like that you in Kanzashi in Bloom will learn some of the history behind this craft and view beautiful images of traditional kanzashi flowers with some different styles. It makes you realize how much we have to learn from other people?s culture, history and traditions, and from our own! The instructions in the book are easy to follow, and Diane shows you how you can vary the look of your flowers with different folding techniques, fabrics qualities or by varying the amount of petals or size of fabric squares. I love the Christmas ornament flowers, and can see myself folding some flower to make a garland to decorate a mirror, mobile or curtain display. This kanzashi craft would be a great book/project to gather around with friends for a wintery Crafternoon with lots of inspiration, warm tea, folding flowers and eating cookies. Yum! Now, go get the book from Amazon for yourself or a crafty friend – or add it to your wish list. Full title: Kanzashi in Bloom: 20 Simple Fold-and-Sew Projects to Wear and Give by Diana Gilleland of favorite newly remodeled CraftyPod blog! 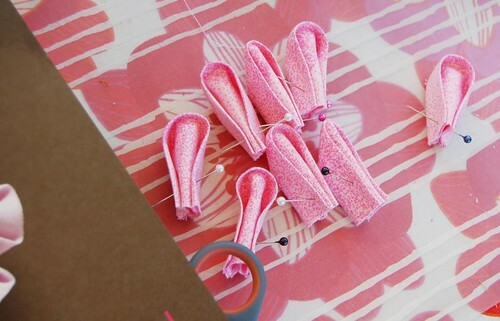 I will post my hat project tomorrow, there you’ll see where my own pink kanzashi ended up? 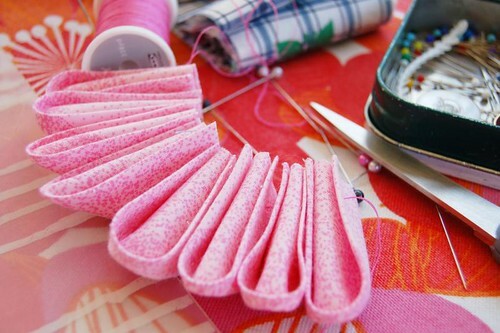 * The Kanzashi blog – the video and more fun stuff are published here! * Kanzashi in bloom flickr pool – lots of photo inspiration! * Kanzashi in Bloom – get the book! * My book recommendations – links, reviews and inspiration books I love! This entry was posted in Book Reviews and tagged crafternoon, fabric, flower, Japan, momcraft. Bookmark the permalink. Wow, Hanna – what a lovely review! Thank you so much for this thoughtful, detailed post. I totally love knowing that you and your Mom made Kanzashi together, and the flowers in your photos turned out beautifully. Can’t wait to see your hat project tomorrow! Sorry the review was so late, I’ve really been wanting to write about it like for ever, but yes, it’s a new year and a new me! ;-) Thanks for the book, you did a wonderful job with it Diane! It IS amazing how much they don’t look like fabric. Wow. I might give this a try. I also think that my daughter might like it, especially since she is a whiz at origami. wow.i never knew you could do a type of origami with fabric.Sounds cool.im guessing you made the flowers in the pictures(or your mum), there really pretty. A great review. Now I’m definately adding this book to my list. Thanks for visiting me at my blog. Happy New Year! Oh Hanna, what a great review! Really, you need to recover quickly from you procrastination flu because you have a gift for writing and this review is proof! 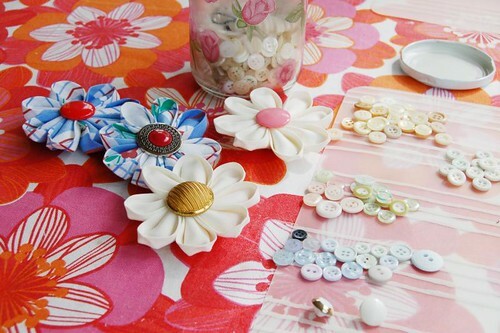 I am delighted to hear that you and your Mom played with Kanzashi together – I love the results – beautiful! 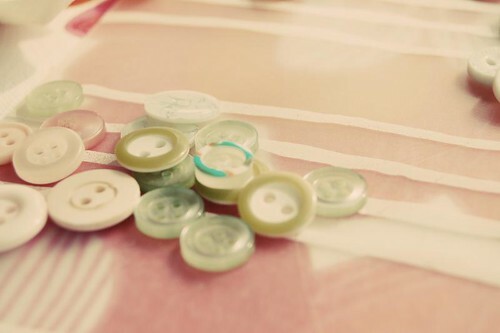 I never get tired of seeing them in new fabrics, patterns, textures, petal combinations. And you are doing a great job with your photography by the way! I’ve been dithering over whether to buy this book for a while – I love the flowers and want to find out more. Your review was so clear and helpful – mind made up – off to Amazon to order it later! Hoorah!